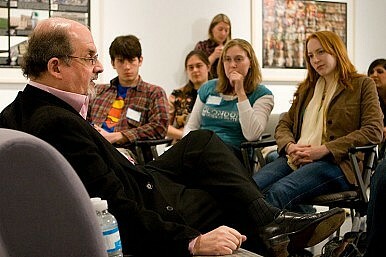 Salman Rushdie has arrived in India for the premier of Midnight’s Children. Predictably, controversy has followed. So goes the tagline for Oscar-nominated director Deepa Mehta’s film adaptation of Salman Rushdie’s postcolonial, magical realist novel Midnight’s Children, which won the Booker Prize in 1981 as well as the Booker of Bookers. Rushdie, who has an uneasy relationship with his home country due to the “controversial” epithet routinely attached to his name, arrived in India on Wednesday to promote the film, alongside Mehta. The duo – Rushdie penned the script –will attend its premiere, a select private screening, on January 31 in Mumbai. Despite a good dose of fanfare, it’s a small miracle that the film has made it this far. As recently as last autumn, it was uncertain whether the movie would even find a distributor in India. With the publication of Rushdie’s 1989 novel The Satanic Verses, Rushdie has spent the past two decades dodging Islamist threats.The book was banned across the Muslim world and a fatwa was directed at the writer by Ayatollah Ruhollah Khomeini on Radio Tehran in February 1989. While fears tied to the fatwa have largely receded, Rushdie’s image as a contentious author still linger in the Muslim world today. Predictably, a swill of controversy has surrounded the author’s visit to promote the film—a reaction that he finds wearying. Whether or not better sense prevails remains to be seen, but if Rushdie’s recent interactions with India are anything to go by, the prognosis doesn’t look good.The author was forced to withdraw from a literary festival in the northwestern city of Jaipur in January 2012 amid warnings by intelligence officials of assassins furnished with weapons by a “mafia don” in Mumbai and angry Islamist protests. A video address was then planned, but also cancelled due to police fear of a terrorist attack. Despite these setbacks, the film was ultimately picked up by PVR Pictures and is set for release on February 1. As the film’s tagline suggests, viewers are taken on a rollercoaster ride through India’s turbulent modern history, stretching from the end of the British Raj through the tumult that followed. The epic tale begins on the eve of India’s independence from the British Raj, at the stroke of midnight on August 15, 1947.The story revolves around two newborn boys who are switched at birth by a nurse in a Bombay hospital, and who each go on to live the destiny meant for the other. Ultimately, their lives converge while India itself undergoes its tragic fits and starts. Amid the weightiness of these themes and the controversy surrounding the film in India, Rushdie makes an unexpected appearance in the film himself – not as a writer, but as a singer. After living through a decade of fatwa-induced isolation and now crooning on screen for the world to see, surely there is not much else for this celebrated author to fear. The niece of the late Benazir Bhutto surprises many at the Jaipur festival with a scathing critique of Imran Khan.